Eating a raw soup made from fresh veggies is a wonderful opportunity to introduce easy to digest and absorb vitamins and minerals into your diet. It’s even easier to absorb raw veggie juices, but veggie soups might feel more filling and satisfying than juices, especially if you add some type of raw vegan fat to your soup, which makes it even more satisfying and relaxing. 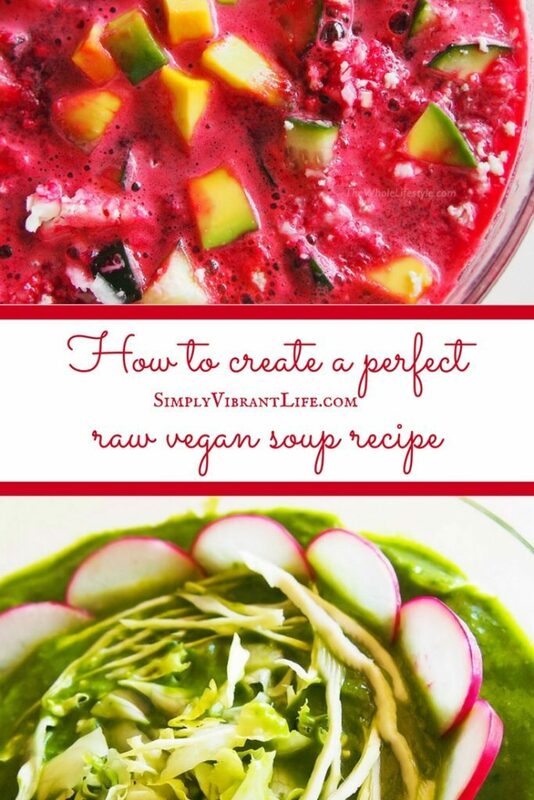 To make your raw soup, you can blend one to three types of veggies, one or two types of raw vegan fat and few fresh herbs. Then, you can chop or shred some veggies to add some crunchiness and chewiness to your soup. The most important part of any soup is a liquid base. In case of our raw vegan soup, it can be done from blended juicy vegetables. Tomatoes, cucumber and cerely are the best. Another alternative for a soup base could be a vegetable juice or a green juice. You can juice any root veggies, juicy vegetables, pumpkins or even leafy greens. Carrots, beets, sweet potatoes, tomatoes, celery and cucumber are just a few wonderful examples. Please note, that when you are juicing pumpkins or zucchini, you need to add some acidic ingredients, like tomatoes or lemons. This will help to avoid oxidation of these tricky vegetables from the squash family. If you wish to make your soup thicker and more filling, you can blend some denser veggies into your liquid base. For example, tomato blended with pumpkin makes an awesome creamy combination. 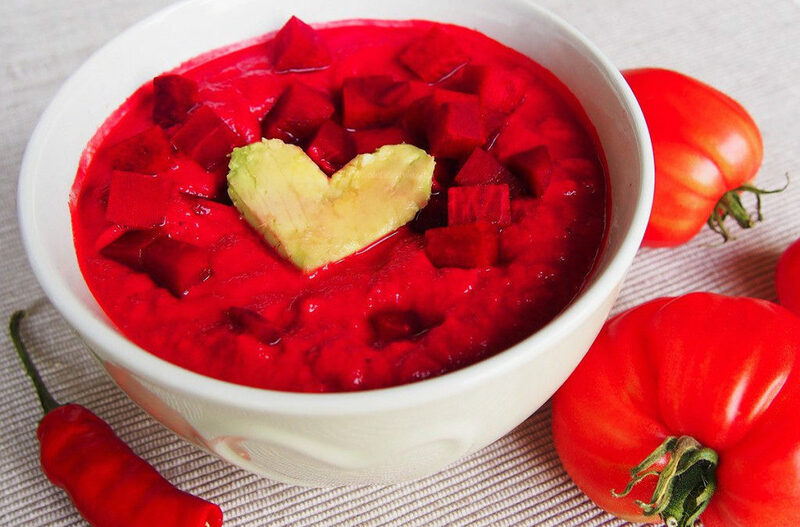 You could even blend beet juice with some beets to make a base for a thicker borsh. Any delicious vegetables or veggie juice blended with any denser veggies would do the trick. Although I have to warn you here, that blending or juicing cabbage or any other cruciferous vegetables is creating a slightly sharp taste. Try making just a small batch of it and see if you like it. Any kind of lettuce is another ingredient that often reacts to blending in unpredictable ways. The taste might come out bland or oxidized, so experiment with a small batch first. I prefer to chop lettuce in my salads or soups instead of blending it. Pumpkins, squashes and zucchini are also very tricky ingredients. If you blend, juice of shred them without adding any acidic produce, they usually oxidize. The perfect ingredient to help with oxidination is tomato or lemon juice. The most significant trick to make your raw soup filling and satisfying is to add some source of fat to it. Avocados can turn almost any blended soup into a dreamy creamy delicacy. You can also blend in any soaked nuts or seeds. To get a creamy consistency with these harder to break down ingredients, you would need to use a powerful blender. If you don’t have this kind of equipment, you can dry your soaked nuts or seed and then grind them in a coffee grinder. After that, use your regular blender and add grind nuts or seeds into your soup. For a juice-based soup, juice one to four types of any vegetables. Please note that cruciferous veggies make a juice taste kind of sharp or spicy. Also, always juice any squashes with something acidic. For a blended soup, you need to blend some juicy veggies first, like tomatoes, cucumbers or celery. Of cause you can blend them all together with tougher veggies, just put juicier ones closer to the blender’s blade. Next, blend in one to three types of veggies if you wish to make your soup thicker. Powerful blender will give you creamier consistency. You can use same types of veggies you juiced. Make it interesting. You can also blend in dehydrated veggies, like dried celery, tomatoes, mushrooms, seaweeds, etc. This step is optional. The most important part for making your raw soup satisfing. Add one or two types of raw vegan fat, like avocado, olives, nuts, or seeds. You can blend these fatty ingredients with your soup, chop them or simply toss them in. Just make sure to soak your spouts or seeds first. Now, let’s chop or shred in a few more veggies to give your soup some chewiness or crunch. You can use same types of veggies again. And a final touch – add some herbs or spices. If you want your soup to be warm, you can gently heat it up to 41 degrees Celsius in dehydrator or in a warm water “bath”. To do that, you can just place your bowl of soup into another bowl of warm water. You can experiment with temperatures to get the desired effect. NB! Be careful with adding too many herbs, listen to your body’s reaction! It is always best to have your herbs fresh, but you can use rawly dried (under 40 degrees Celsius) herbs in small quantities if you don’t have fresh ones. 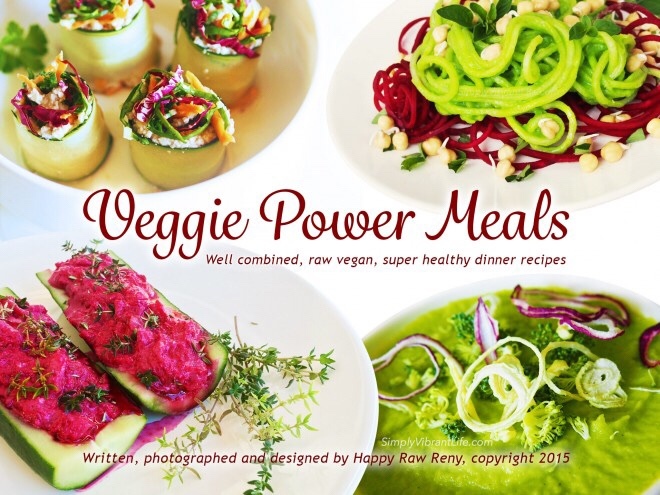 If you would like to get a whole e-book full of tasty, savory and satisfying raw vegan recipes, you can get it here: Veggie Power Meals. Reny is a raw vegan educator, YouTuber, yoga teacher and author. She is passionate about fitness, meditation, self-empowerment and healthy nutrition.